Men, here’s one for you: Have you ever wanted to pee into a waterfall without getting busted or worrying about the ranger treating you to a lecture about campers drinking downstream? 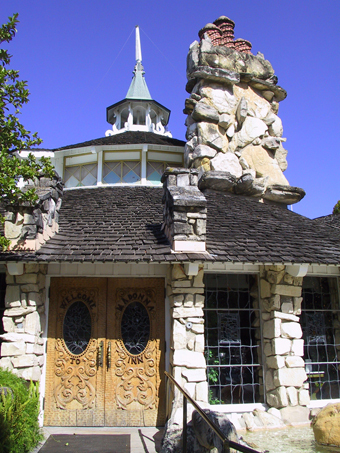 Take a trip up the 101 to San Luis Obispo and the Madonna Inn. from the doorway. The contraption is activated by an electric eye that triggers an eight-foot-high cleansing cascade whenever someone or something interrupts the waist-high beam. Kitsch-comfort is further assured at the washbasin, where the spigots are solid brass, and the sinks are made of giant clamshells. This precious landmark of our cultural heritage was the brainchild of eccentric philanthropist Alex Madonna (his real name) who made his fortune in ranching and road building, then decided to build a hotel on the central coast. It opened for business in 1958. 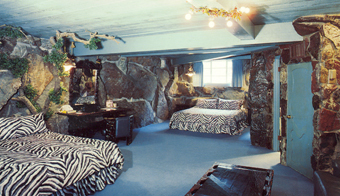 Of the 109 rooms at the Madonna Inn, each has a unique theme: the “Caveman Room” features rock walls and leopard skin-print sheets on the bed, while the “Pick & Shovel Room” has tractor seats for barstools, a 31-foot leather couch, and sleeps nine. Some rooms are booked years in advance. Madonna and his wife never tired of coming up with gimmicks, such as the hotel restaurant, called the Copper Café. Visitors eat off shiny copper tables, and your coffee can be sweetened with sugar, which has been colored a vivid blue. Men who can’t make the dash downstairs to the waterfall can avail themselves of the restaurant’s washroom, featuring a towering copper trough urinal, which is flushed by activating another electric eye which starts up a waterwheel. Not being a woman, I didn’t check the ladies’ pissoir, and no references are available on these mysterious redoubts. Mr. Madonna (and his wife) really liked the color pink: The exterior of the buildings are pink, most of the carpets are pink, as is the giant sign along the freeway—outlined with a garish dark green trim. Uptight locals went into a tizzy in 2001 when the owners repainted the sign, saying that it was an even more shocking pink than they ever remembered, but since they only had a black-and-white picture of the original, Madonna won the battle. The Copper Café still serves pink french toast. Madonna Inn: 100 Madonna Road, San Luis Obispo. Look for the Big Pink Sign and exit highway 101 at Madonna Road.